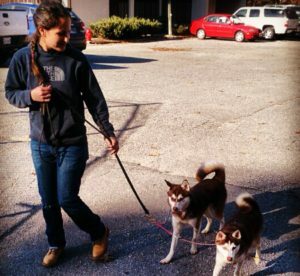 Jes joined Premier Dog Training in 2009 and brought with her years of experience, not only as a dog trainer, but in the retail aspect as well. Her extensive knowledge of medicines, grooming needs, supplies and equipment, adds to Premier a new dimension. Jes enjoyed a successful career for eight years in the pet supply and commercial sales industry before partnering with Rick. Since joining Premier, Jes has expanded her scope of training to include various techniques such as compulsion and operant conditioning, to compliment her extensive knowledge of positive reinforcement, treat, and clicker training. Jes’s credentials include active memberships in The International Association of Canine Professionals, and The Association of Pet Dog Trainers. She also serves as a volunteer with several local rescue organizations. She has demonstrated a unique ability to communicate with the dogs, producing well trained, obedient pets on a consistent basis. Her approach is caring while demanding, kind while consistent, and loving while firm.